BEAVERTON, Ore. (May 15, 2012 ) – There’s a new addition to the successful Nike Method putter franchise and it has a dark side. 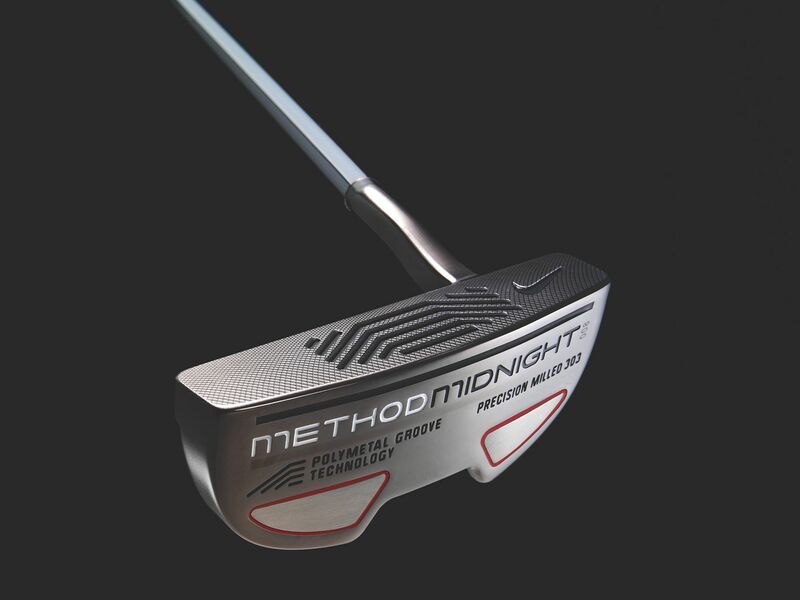 Nike Golf is introducing the Nike Method Midnight putter that features Nike’s revolutionary polymetal groove technology, which has been instrumental in the 34 wins by Nike athletes on the Professional Tours worldwide. (FALLS CHURCH, VA) – Tin Cup Products, LLC – maker of patented, Made in the USA golf ball marking stencils – announces the addition of seven designs for six universities to its popular collection of 30 officially-licensed college cups. Since being named “Best New Product” at the 2010 PGA Merchandise Show, the company has grown rapidly. Its personalization process takes just seconds, as players simply place the stencil over a ball and trace the template using an ultra fine point permanent Sharpie. The ever-expanding Tin Cup collection now features more than 90 designs, including a wide range of emblems from all four major military branches and visualization/game improvement marks. Complementing popular styles like Luck of the Irish, Five O’Clock Somewhere and Jolly Roger, new products are introduced each month. An affordable customization program used by well-known corporations, charities, media outlets, celebrities and many others is also available. Used by PGA, European, Champions and LPGA Tour players, Tin Cup’s patented golf ball marking stencils are crafted from 100 percent stainless steel and Made in the USA. The entire personalization process takes just seconds, as players simply place the Tin Cup of their choice over a golf ball and trace the design using an ultra fine point permanent Sharpie. In addition to more than 90 existing models, Tin Cup introduces new stencils introduced monthly. Its customization program provides low minimums, affordable pricing and prompt delivery for corporations, charities, media outlets, celebrities, events and others seeking a distinctive gift. Tin Cup stencils are currently sold at more than 750 retail locations worldwide, including PGA Superstore, Edwin Watts, Roger Dunn and Golfsmith, as well as elite clubs and resorts like Baltusrol, Bandon Dunes, Congressional, Kingsmill, Medinah, Reynolds Plantation, The Boulders, Torrey Pines, Wailea and Sea Island. The company also has distribution in Canada, the UK and Japan. Faldo Golf Institute Hosts Wounded Soldiers From U.S. &amp; U.K.
ORLANDO, Fla. – May 17, 2012…The acclaimed Faldo Golf Institute (FGI) by Marriott, one of the nation’s leading golf schools created by legendary Six-Time Major Champion Sir Nick Faldo, recently hosted a group of wounded soldiers from the U. S. and U.K., providing a week-long golfing experience highlighted by instruction and on-course play at Marriott’s Grande Vista Resort in Orlando, Fla.
As golf has become a therapeutic part of the rehabilitation for many wounded war veterans, certified golf instructors from the Faldo Golf Institute have created a unique golf school program for the past three years, working closely with wounded soldiers from the U.K.-based On Course Foundation, as well as a group of Orlando-based U.S. Wounded Warriors. The experience provides a week of camaraderie and expert golf instruction, while using the game of golf as a morale boost for injured veterans/soldiers. The On-Course Foundation was created to help wounded war veterans from the U.K., providing an opportunity for members of the armed forces who have been seriously injured in combat to participate in activities on the golf course. All members have major disabilities, and while some members have played the game prior to their injuries, others have very limited experience. A group of wounded soldiers from the U.S. and U.K., participated in week-long golfing experience at Marriott’s Grande Vista Resort in Orlando, Fla., highlighted by instruction at the acclaimed Faldo Golf Institute. The Johnny Shotz BGT Masters at Beach Grove on Monday May 14th, saw 79 golfers compete for an extra $250 prize pot compliments of Johnny Shotz. The course was in great shape for this time of year and the weather superb. Bob Duff from the Windsor Star came out and interviewed us and here is the resulting article that showed up in the paper Tuesday May 15th. Thanks Duffer. WINDSOR CHAPTER- Monday May 14th- 1st MAJOR OF THE SEASON the “Johnny Shotz Masters” at Beach Grove Golf & Country Club- shotgun start at 1 p.m.
DETROIT CHAPTER- Monday May 21st- 1st DETROIT MAJOR of the Season- the “Sharkey’s Riverfront Tavern Masters” at Grosse Ile Golf & Country Club- shotgun start at 1 p.m. carts included for $90 tournament fee for this private course- Major event with an extra $250 in prize money compliments of Sharkey’s Riverfront Tavern. SPOTS STILL AVAILABLE, REGISTER NOW. Tee sheet closes Saturday May 19th. Go to http://www.bogeygolftour.com/detroit for more details. KITCHENER/WATERLOO CHAPTER- Monday May 21st- “ST. LOUIS Bar & Grill” K/W Open at Conestoga- Noon tee Times, cart & lunch included for $85 tournament fee- 4 spots still available, REGISTER NOW. Tee sheet closes Saturday May 19th. Go to http://www.bogeygolftour.com/kit for more details. KITCHENER/WATERLOO CHAPTER-Saturday May 26th- CHARITY EVENT- “Hitting the links for Hope” at Rebel Creek- shotgun start at noon, 4 person scramble format, driving range, cart, dinner, prizes and a $50 tax receipt for $160 tournament fee. Proceeds go to the “Children’s Wish” foundation. ONLY 4 SPOTS LEFT Register today. WINDSOR CHAPTER- Sunday May 27th- The “AM800” Classic at Blenheim Golf Club- shotgun start at 1 p.m. carts included for $55 tournament fee- register by Sunday May 20th to guarantee your spot. Go to http://www.bogeygolftour.com/wnd for more details. We look forward to seeing you out on the links soon. ORLANDO, Fla. – May 17, 2012 … Marriott Golf, one of the world’s premier golf operators and the golf management organization of Marriott International, Inc. (NYSE:MAR), today introduced “Fairways-Fore- FREEdom,” a new military program designed to support the men and women dedicated to protecting America’s freedom. In celebrating America ’s armed forces, “Fairways-Fore-FREEdom” provides active, reserve and retired military personnel with both free and discount golf at over 25 acclaimed Marriott Golf courses throughout the United States . The “Fairways-Fore-FREEdom” military golf program, which cannot be combined with any other offer, is based on availability at participating Marriott Golf-managed courses, and certain restrictions may apply. This offer is valid for active, reserve, and retired personnel from the Army, Navy, Marines, Air Force, National Guard and Coast Guard. For more information on the program, visit http://www.marriottgolf.com. Marriott Golf manages 61 golf courses at 44 locations in 12 countries, offering more than 1,000 holes of championship golf. Marriott has been managing golf operations since 1970 and is one of the world’s premier golf operators. Marriott provides golf management and consulting services to a variety of operational environments including resort, private club, daily fee, golf school and franchises. For more information, visit http://www.marriottgolf.com. Click here for Marriott International, Inc. (NYSE:MAR) company information. (MARLBOROUGH, MA) – CHAMP/MacNeill Engineering Worldwide – The World Leader in Sport Cleat Technology® and maker of innovative CHAMP spikes, high-performance golf tees and accessories – confirms the winner of the Wells Fargo Championship relied on a blaze orange colored Zarma FLYTee en route to securing his first PGA Tour title. Featuring a six-pronged head and shallow cup to reduce friction while promoting increased distance and accuracy, the FLYTee is used by a large and growing number of the world’s best players. During the competition at Quail Hollow Club in Charlotte, NC, the champion averaged more than 300 yards in driving distance and tied-for-second in driving accuracy. All Zarma FLYTee models are constructed using a market-proven bio-agent additive created by ECM Biofilms, Inc. This enables microorganisms to metabolize the plastic into humus, an organic matter which benefits the environment. Earlier this season, CHAMP unveiled the new MyHite FLYTee, which features a series of colored bands around the stem, allowing golfers to always place the ball at a consistent height. This unique design maximizes consistency by ensuring repeatable performance with every swing. Beyond the scoring and environmental advantages, these tees are five times more durable than traditional wooden offerings and help facilities dramatically improve course operations, appearance and profitability by reducing tee consumption, decreasing tee litter and lowering purchasing expenses. (FALLS CHURCH, VA) – Tin Cup Products, LLC – maker of patented, Made in the USA golf ball marking stencils – announces the introduction of two new designs, Take Aim and Stinger, to its award-winning catalog of in-stock styles. Joining the new visualization series, Take Aim features a modified bulls-eye pattern with lines to help golfers envision their target path. Stinger depicts the side profile of a bee ready to strike, joining the company’s other playful and lighthearted offerings. These models join the nearly 100 styles available at http://www.tin-cup.com and more than 750 worldwide locations. Every Tin Cup ($19.95) allows players to personalize their golf balls in seconds by placing the stencil over a ball and tracing the template using an ultra fine point permanent Sharpie. Constructed from 100 percent stainless steel, they are ideal for any golfer and make perfect gifts for tournaments, corporate outings, wedding parties, holidays and events. Since being named “Best New Product” at the 2010 PGA Merchandise Show, the company has grown rapidly. Complementing popular styles like Luck of the Irish, Five O’Clock Somewhere and Jolly Roger, Tin Cup features designs with military emblems and officially-licensed collegiate logos. It also offers an affordable customization program that’s trusted by well-known corporations, charities, media outlets, celebrities and many others. BEAVERTON, Ore. (May 7, 2012)– The Swoosh was atop the leaderboard in Europe this weekend as Nike Golf athletes Francesco Molinari and Carly Booth secure wins at the Reale Seguros Open de Espana and the Aberdeen Asset Management Ladies Scottish Open, respectively. Using the new Nike VR_S Driver, a prototype Nike Method Core putter and the revolutionary Nike 20XI X golf ball, Molinari shot a final round 65, the best round on the European Tour this week. Molinari, who is currently fourth (80%) in greens in regulation on the European PGA Tour, won by a three-shot margin to secure his third European Tour Victory. On the Ladies European Tour, Booth grabbed her first career title, becoming the youngest winner of the Scottish Open. The 19-year-old Scottish teenager, who described her victory as a “dream come true,” also used the new Nike VR_S Driver, a Method Putter and the 20XI X golf ball for her win. This triumph comes just three weeks after her recent victory on the Ladies European Tour Access Series Developmental Tour. 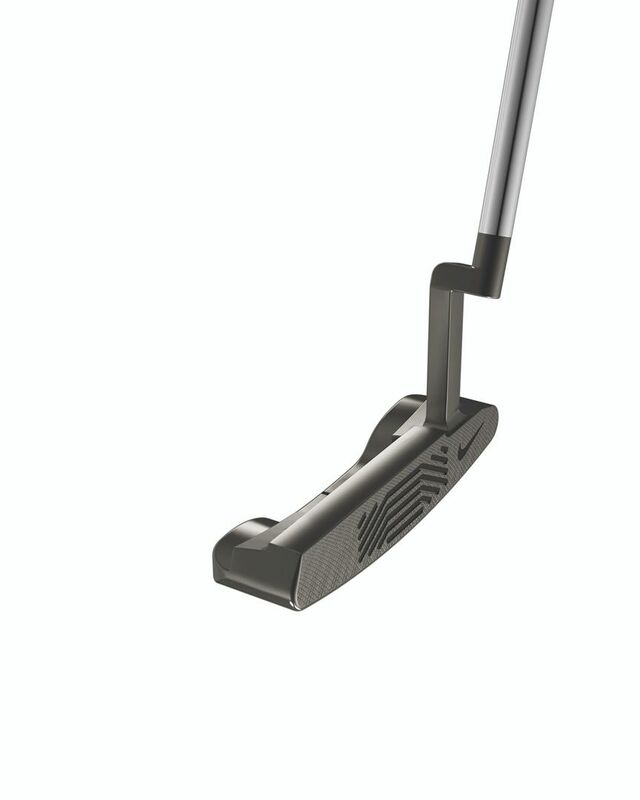 Molinari and Booth’s respective victories bring to 33 the number of global wins with the Nike Method Putter. Generating more distance for every shot, the Nike VR_S is an extension of the original VR line, which has more than 85 worldwide professional wins including three major championships. On the body, both Molinari and Booth wore Nike Golf Apparel and Nike Golf Footwear. Located at NIKE’s World Headquarters in Beaverton, Oregon, Nike Golf designs and markets golf equipment, apparel, balls, footwear, bags and accessories worldwide. Nike Golf is passionately dedicated to ushering in the future of this great sport by developing ground-breaking innovations that enable and inspire athletes to become better. For more information on Nike Golf, visit our Web site at http://www.nikegolf . To follow Nike Golf on Twitter visit http://www.twitter.com/nikegolf and to become a fan on facebook go to http://www.facebook.com/nikegolf . To view Nike Golf videos subscribe to our You Tube channel at http://www.youtube.com/nikegolf . Editors and journalists in the U.S. seeking editorial information and downloadable images, visit http://www.nikegolf.com/presscenter . For international journalists, please contact Nike Golf’s public relations representative in respective countries for information. Golfers from Michigan and Ontario teed it up for the first Bogey Golf Tour Detroit Chapter event on Saturday May 5th, 2012. Fox Hills staff and facilities were excellent, and everyone in attendance enjoyed the sunshine. For Full Stats, skins, long drive, closest to the pin, and the Miles of Golf BGT Cup Standings go to http://www.bogeygolftour.com/detroit/stats . WINDSOR CHAPTER- Monday May 14th- 1st MAJOR OF THE SEASON the “Johnny Shotz Masters” at Beach Grove Golf & Country Club- shotgun start at 1 p.m. carts included $105 tournament fee for this private course- Major event with an extra $250 in prize money compliments of Johnny Shotz. Plus another chance to win a 2012 Dodge Journey with a Hole in One, compliments of Provincial Chrysler. Register TODAY to guarantee your spot. Go to http://www.bogeygolftour.com/wnd for more details. DETROIT CHAPTER- Monday May 21st- 1st Detroit MAJOR of the Season- the “Sharkey’s Riverfront Tavern Masters” at Grosse Ile Golf & Country Club- shotgun start at 1 p.m. carts included for $90 tournament fee for this private course- Major event with an extra $250 in prize money compliments of Sharkey’s Riverfront Tavern. Register by Monday May 14th to guarantee your spot. Go to http://www.bogeygolftour.com/detroit for more details. KITCHENER/WATERLOO CHAPTER- Monday May 21st- “ST. LOUIS Bar & Grill” K/W Open at Conestoga- Noon tee Times, cart & lunch included for $85 tournament fee- register by Monday May 14th . Go to http://www.bogeygolftour.com/kit for more details. KITCHENER/WATERLOO CHAPTER-Saturday May 26th- CHARITY EVENT- “Hitting the links for Hope” at Rebel Creek- shotgun start at 1 p.m., 4 person scramble format, driving range, cart, dinner, prizes and a $50 tax receipt for $160 tournament fee. Proceeds go to the “Children’s Wish” foundation. Go to http://www.bogeygolftour.com/kit for more details. WINDSOR CHAPTER- Sunday May 27th- The “AM800” Classic at Blenheim Golf Club- shotgun start at 1 p.m. carts included for $55 tournament fee- register by Sunday May 20th to guarantee your spot. Go to http://www.bogeygolftour.com/wnd for more details. (HUNTINGTON BEACH, CA) – Club Glove® – a worldwide leader in the design and manufacture of premium travel bags, golf bags, club covers and accessories – confirms its ultra-premium TRS Ballistic luggage is used week after week by more than 100 PGA Tour stars, including Hunter Mahan, Bill Haas, Justin Rose, Nick Watney, Webb Simpson and world No.1 Luke Donald. Designed for the affluent golfer or globetrotter, each piece features U.S. woven INVISTA CORDURA® 1050 denier Nylon Ballistic fabric, which offers double the abrasion resistance and four times the tear resistance of other premium materials. 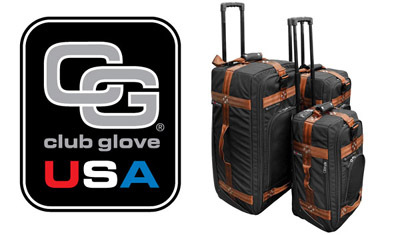 When used as a set, the collection showcases Club Glove’s renowned, patent-pending Train Reaction system that drastically reduces the amount of effort needed to pull or push gear by creating a perfect center of gravity to make bags feel weightless. Also among the large and growing roster of Tour players who have “Gone Ballistic” are Kyle Stanley, Matt Kuchar, Camilo Villegas, Johnson Wagner, Zach Johnson, Mark Wilson, Davis Love III, Chris DiMarco, Jonathan Byrd, David Toms, Scott Stallings, Charles Howell III, Martin Laird, Sean O’Hair, Mark Wilson, Justin Leonard, Colin Montgomerie, Ricky Barnes, Carl Pettersson and many more. Other celebrity athletes endorsing TRS Ballistic include Josh Beckett, Jon Lester and Clay Buchholz of the Boston Red Sox. The durable, stylish and Made-in-the-USA collection consists of a carry-on ($699), check-in ($750) and XL check-in ($799) bags and is also available as a set ($2,248). Club Glove recently announced the addition of a stylish two-tone black and bronze color scheme to compliment the original, category-defining collection. Club Glove is the No. 1 golf travel bag brand at all PGA and Champions Tour events. The Darrell Survey confirmed that the brand is preferred by 90 percent of PGA Tour Players. Selected by six U.S. Ryder Cup teams, Club Glove’s golf bags have been a fixture at green grass and off course shops for nearly a decade and are available in stand, cart and Sunday versions. The company’s Last Bag was honored by Golf World magazine as one of the game’s “10 Best Innovations.” This signature golf travel bag was recognized for its extreme durability, extra thick foam padding and patented high-impact plastic wheel base that cradles and shields the bottom of the bag.